We recommend rebalancing your tyres to extend their lifespan and ensure your safety on the road. There are a number of factors that can cause a vehicles wheels to become unbalanced, with the most common being your vehicle suffering an impact from a kerb or pothole. Wheel balancing (Tyre Balancing) will ensure that weight is evenly distributed around the wheel and means that the tyre can rotate evenly. Wheels and tyres are never exactly the same weight all around and this valuable balancing service is essential in maintaining consistent performance and efficiency. At Bourne Car & Van Hire, Bourne, Lincolnshire we use the latest technology to help ensure that your wheels are balanced as perfectly as possible. It’s important to not ignore wheels that are not correctly balanced, ensuring you receive the best ride comfort. Incorrectly balanced wheels produce a vibration that is noticeable through the steering wheel when travelling at higher speeds. These vibrations can result in stress being created in other essential parts of the vehicle. This increased stress will lead to them wearing out prematurely and will mean you will have to replace them sooner. In addition to this, balance issues can cause premature wearing of your tyres. Correctly balanced wheels can save you considerably on both your vehicles fuel efficiency and also on your carbon emissions. If you have incorrect balancing of your vehicle wheels it will have a very negative effect on your fuel economy due to tyre rolling resistance. Wheel balance issues will also result in premature wearing of your tyres. You will experience more even tyre wear with correctly balanced wheels which will help to increase the life of your tyres, saving you money in the long run. Incorrectly balanced wheels will vibrate and this can be felt quite harshly through the steering wheel. Having them balanced will improve the overall ride and performance of your wheels. If your wheels are not perfectly balanced there is a risk that it could impact on both the steering performance of your vehicle and result in an increase in breaking distances. How are my wheels balanced? This is done by counter-balancing the weight difference of each wheel. 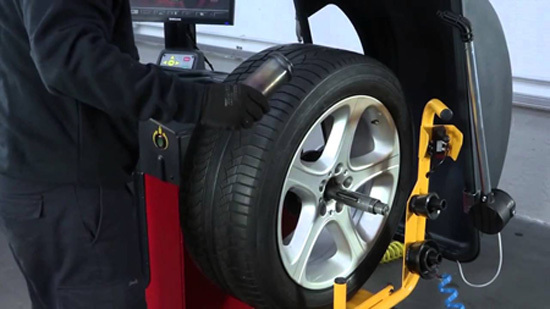 Wheel balancing involves fitting the wheel & tyre unit on to a balancing machine, which centres the wheel and spins it to help determine where the weights should go. The machine rotates the tyre and wheel assembly and can automatically calculate the weight and location of the balance counter weight. If on inspection, an imbalance towards one side of the wheel is identified, meaning that one part of a wheel has additional weight on it. Weights will be added to the opposite side to even them out. At Bourne Car & Van Hire, Bourne, Lincolnshire, our specially trained experts can ensure your wheels are professionally balanced, using specialist wheel balancing equipment.